Motifs in Cinema is a discourse across film blogs, assessing the way in which various thematic elements have been used in the 2012 cinematic landscape. How does a common theme vary in use from a comedy to a drama? Are filmmakers working from a similar canvas when they assess the issue of death or the dynamics of revenge? Like most things, a film begins with an idea – Motifs in Cinema assesses how the use of a common theme across various films changes when utilized by different artists. I suppose the point of this exercise is to objectively write about both luck and fate as equally represented in this year’s cinema. I’ll start with three movies that I thought profess the powers of fate over luck. It seems that heroes can’t escape their fates, the latter manifesting in their respective villains, buy you can also argue that these protagonists are unlucky to have such grugdge-fueled antagonists. Les Miserables is an epic spanning many decades, kings, republics, revolutions and tragic female deaths. But there’s a notoriously succinct spoiler on the doorstop – adapted by Tom Hooper – where, spoilers, it’s all about Javert chasing Jean Valjean into a river. It matters less to me whether a hero wins over his villain and more that fate – and the rules of drama – forces them meet. It doesn’t matter, in Christopher Nolan’s The Dark Knight Rises, that Bruce Wayne mopes for almost a decade – he has to face Ra’s al Ghul’s dysfunctional family, including the latter’s daughter Talia and her lover, Bane. Elizabeth Shaw, with her quest to know life’s origins, is bound to meet the titular Prometheus, as she herself contributes to creating different monstrous life forms. In Sam Mendes’ Skyfall, James Bond helps M hide in Scotland but she will eventually face her persistent prodigal son, Raoul Silva, into a Pyrrhic victory. There are some situations where the protagonists don’t have other characters as villains but instead their fighting concepts, societal oppression, injustice. Fate has its hand in helping these protagonists in David Mitchell’s Cloud Atlas. Yes, free will factors into the decisions of the characters within the book’s cinematic adaptation by Tom Tykwer and the Wachowskis but only as a part of a chain reaction from another character’s actions. And to show the effect of this chain reaction we get to see at least four centuries when six different protagonists live, each of them living their own revolution as inspired by each other. Sam will be of draft age when Vietnam’s at its worst. Wes Anderson’s been known to show the heartbreaking interior within movies that otherwise would have been maligned for its twee surfaces and Moonrise is no exception. Even the smallest and harmless looking institutions – like the Boy Scouts and Social Services – in an otherwise insular island like the fictional New Penzance are militaristic and preparing its young recruits for the slaughter. 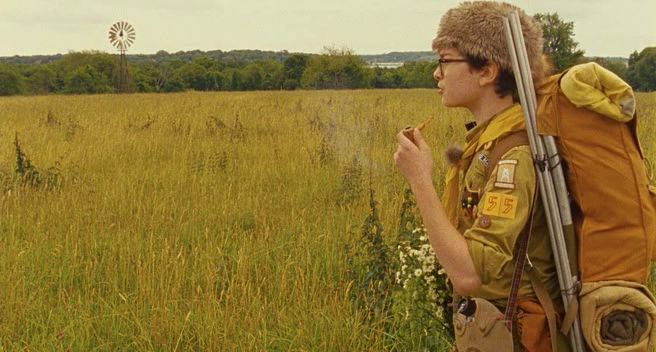 This perspective on Moonrise Kingdom is new to me and it opens up a way of looking at movies. These movies only serve as snippets of their lives, segments that would be weaved into a larger, even national story. It reminds me of what someone tweeted about The Master, Paul Thomas Anderson showing these characters slowly paving – or slow boating – the way toward the Sexual Revolution. Both movies show America is different stages of adolescence, a decade or less before its many destinies. This year’s movies shows us many characters exploring different eras and territories which become problematic for the characters who explore them. In Argo, what happens to Sahar, the woman who helped save the Americans in hiding during the Iran Hostage Crisis? It’s established that it’s not a good idea for her to leave Iran, America’s enemy, for Iraq, America’s former enemy. Is it also enough that Broomhilda, and her titular hero Django in Django Unchained blew up Candieland? Will the other Plantation owners hunt the people responsible for Calvin Candie’s death? Will the West be as hostile to the couple as the South has been? I pose the same questions for Cid from Rian Johnson’s Looper, a movie that plays with the notion of fate by showing different alternate universes. When Joe kills himself while saving Cid and his mother Sara, has Joe really stopped Cid from becoming the destructive super-villain whom the latter is meant to become? Sahar, Django and Cid are contemporary versions of Antoine Doinel, leaving troubled lands and histories for frontiers, the latter symbolizing the troubling uncertainty of their fates. And it’s good to question these things, an activity that this year’s filmmakers openly encourage, knowing that great contemporary storytellers don’t wrap their creations in neat little bows. This entry was posted on February 16, 2013 by paolocase. It was filed under Movies and was tagged with 2012, Christopher Nolan, Paul Thomas Anderson, Rian Johnson, Sam Mendes, Tom Hooper, Tom Tykwer, Wachowski Brothers, Wes Anderson. Nice to see someone else musing on that “Looper”. It’s to the film’s strength that things are presented to us in a nice bow because the sense of potential unease which everything is bathed in turns the film into something that makes me a bit queasy, in a good way. hmmmm…interesting that you included Django here. But you brought up some good points. And Cloud Atlas is perfect for this theme. Andrew: I was going to comment on your post on how we thought about the same thing on Looper despite having different topics. And yes, I like the queasy feeling too. reel411: Another thing about Django and fate is how Broomhilda is living up to her name by being rescued by Django. Fiction has its way of reinforcing fate by making characters believe the mythologies they’re presented with. Lancaster Dodd has the same mentality but in a more questionable manner.